Anyone who knows me knows that I have a serious chocolate addiction. Apparantly I have passed this down to my sons too. I got a bag of Enjoy Life Double Chocolate Crunch Granola the other day. It’s a new flavor. I tried the Very Berry granola before and it was just okay. But the chocolate…oh dear…is sooo yummy. Today I threw it together with some Enjoy Life Not Nuts, raisins, mini marshmallows, and craisins. My youngest son and I sat down and devoured the whole bag. He prefers to pick out his favorites, while I prefer to take a handful and eat it all at once. There is something about the chocolate, sweet, tart taste all together that I love. Yum! We love the Enjoy Life chocolate granola. I couldn't help but laugh when you said they were mini marshmallows, they look massive in the photo with all the little granola bits surrounding them. 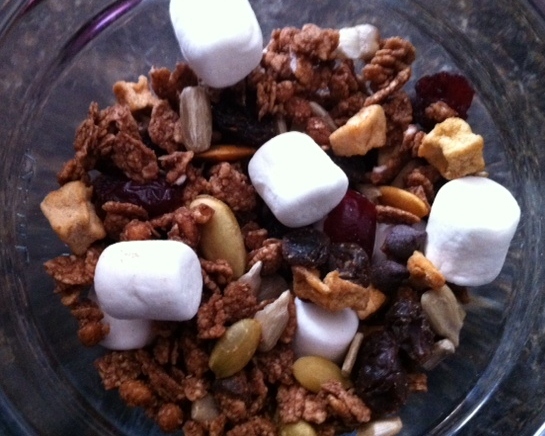 I hadn't thought to make a trail mix out of it… very nice!